Think biblically about all aspects of life from kindergarten to Capstone Senior Thesis. At Trinity, the Bible isn't just the focus of our Christian Studies classes - God's word permeates our arts, our extracurriculars, even our athletics programs. We strive to see the world filtered through the lens of Jesus Christ. Our school is a safe place where students learn about God, wrestle with life’s questions, and build a solid foundation for their Christian faith. The capstone of that foundation is Senior Thesis, a yearlong project that prepares our students to confidently defend their faith in the world outside of Trinity. Throughout the Senior Thesis project, students dig deeper and articulate their own beliefs about different aspects of Christianity. After putting their findings into a paper, students defend their theses orally before a formal panel of faculty and administrators. Uncover new passions in our diverse programs. Our broad liberal arts education prepares students to excel wherever God calls them to serve. Our focus is not requiring additional courses – it is on helping students find areas of giftedness in and outside of the classroom. If you discover a newfound talent in the arts, languages, athletics, or academics, we have the tools to help you find success. Learn from leaders who see their students as image-bearers of Christ and invest in students' minds and hearts. Ask our students and families what the most important resource at Trinity is and they will unanimously tell you that it is our teachers. Our faculty are more than instructors - they are mentors, role models, leaders who begin each day of work by meeting together to pray for the students who will enter their classrooms for eight hours of the day. Our teachers invest time in their students that goes beyond the bell at the end of the class. The most frequent feedback I hear from prospective students is how welcome Trinity students and teachers make them feel when they come to visit classes. It truly is a family atmosphere. It is the number one reason my wife and I decided to move across country to work at TCS. Coach Phillips is an amazing Godly man who has an amazing gift with coaching and students of all ages. He is a fantastic friend and co-worker and I'm so proud of him! There was a strong emphasis on the integration of scripture in all subjects. We also sensed a welcoming community where we could meet and partner with other families who were like-minded in the values that were important to us. Reach your God-given potential with advanced courses and on-campus academic support programs. Without ever having to leave campus, our students have access to peer and faculty content tutors, executive function coaches, standardized test prep, and NILD educational therapy. NILD therapy provides students with one-on-one, individualized intervention that aims to strengthen the underlying causes of learning difficulties. To learn more about the Learning Center, click here. Build meaningful community across Grades K through 12. 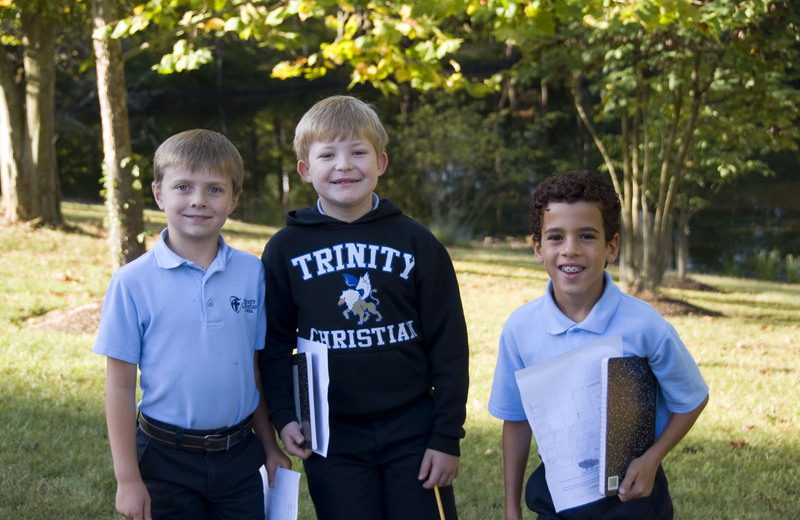 At Trinity, Grades K through 12 are united together on one campus. On the first day of school, Upper School students help younger students find their classes. Throughout the year, Lower School classes meet their older counterparts in joint science labs. Families that call Trinity home for all twelve years of grade school education build lasting bonds between students, parents, and teachers. Our second grade classes teamed up with Mrs. Miller's AP Environmental Science class to conduct a pond/stream study investigating cycles in nature. Fifth grade students partner with the AP Environmental Science class to participate in a fun, hands-on lab about how resources affect a deer population. By acting as resources and the deer themselves, students watch the population rise and fall. “Strings Buddies” share their love of music as upper school students help young mentees with bowing techniques, rehearsal disciplines, and performance-night nerves. Educational internships for juniors and seniors allow students to explore careers in education, partnered with a lower school teacher who serves as a mentor for a semester or for a full year. In the fall of 2016, each Lower School class committed to partner with a small group of the Class of 2017. All 50 seniors "belong" to a class, who encourage them and pray for them regularly! Go above and beyond to serve your neighbor and the world. Service is not something our students do to check a box on a college application or a resume. At Trinity, service is celebrated because we imitate Christ who came not to be served but to serve. We put a strong emphasis on community, and our students rise to the challenge to serve in our neighborhoods, in our nation, and in other countries. Junior Rachel Grace has received an award from the National Society of the Daughters of the American Revolution (DAR). Mr. Livingstone's World War II History class has a long tradition of honoring veteran. In December, his class had the privilege of hosting Dr. Elane Geller, a Holocaust survivor, on Trinity's campus. Dr. Geller spoke in Upper School Chapel and in Mr. Livingstone's WWII History class. In the same week, she traveled with Mr. Livingstone's students to visit the United States Holocaust Memorial Museum for the first time. Trinity's Servant Leaders Club had an amazing turnout during one seminar meeting in December: over one hundred students took time out of their afternoons to visit the Media Center and help make blankets that were later donated to the homeless in our community. In December, Trinity's Upper School students welcomed a special guest to chapel: Chinese singer Vigi Lee.Vigi gave her testimony in chapel and followed with original music that she and her father wrote. After spending just two weeks practicing hand gestures and learning verses, Miss Behrens' kindergarten class successfully memorized the entirety of Luke 2! Their uplifting, adorable video was shared with the TCS community just before our Christmas break. Take a look at the video on our Facebook page here.